This cover is breathable to allow damp & moisture to escape. Features double stitching for strength, non-scratch latest generation material in a royal blue colour and is elasticated front and rear. The fabric is 100% UV resistant and protects against birds, pets, sunlight, dirt & dust and those annoying little scuffs & scratches. 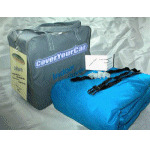 Supplied in a strong zipped storage bag, this cover takes up very little space and can be tucked away easily when not in use. Detachable underbody straps are provided for extra security. Keeps your pride & joy away from prying eyes! This cover has been cleverly designed to fit all New Minis & Coopers including the Cooper S.
Includes the late 07 new shape mini which was slightly longer.